After The Kindred Spirit ended, I met Ron Norris in 1970 and we shared the "front man" position in Chakra. We lived in the Green House, our commune/crash pad in Atlanta. When we traveled we all slept in our old utility van somehow. Ted meditated, the rest of us ate mushrooms and copious amounts of LSD. I remember one day at rehearsal experiencing Universal Love as I lay on the floor with my head inside Ted's kick drum. The original members of Chakra were me, Ron, Ted Levine on drums, Marvin "Stray" Strayton on bass, and Jimmy Godwin on guitar sometimes played with a bow through a Leslie organ speaker. We were happening right at the tail end of "The 60's" and our manager and concert promoter, Alex Cooley, got us gigs at the Atlanta Pop Festival (Hendrix played), Love Valley (with Janice Joplin and Big Brother and the Holding Company, Cream), Strawberry Fields Festival, at Piedmont Park with the Allman Brothers, and other concert venues opening for Ike and Tina Turner, Jefferson Airplane, and other icons of the era. Our "Hit Single" Little Wheel never made it beyond regional hit status, unfortunately. We were a little too late on the scene and our weird record label didn't help much. The rumor is that our producer was killed by a mob hit. Geez. So much for peace and love. 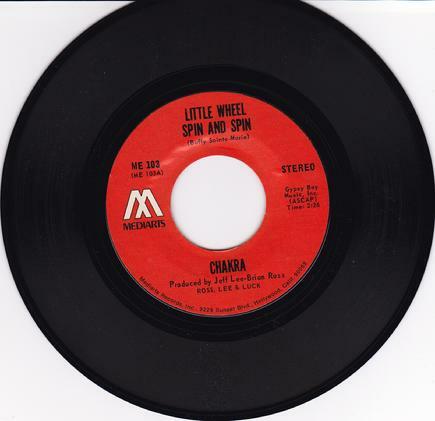 Chakra's 1970 Single "Little Wheel"